The Government of Canada has awarded $11.5 million in Canadian government grants to support 6 manufacturers to accelerate the development of new automotive technologies. The investment will help each Ontario automotive supplier develop innovative technologies to be used in hybrid and electric vehicles. Each project will help address climate change concerns by creating technologies that allow future vehicles to be more environmentally-friendly. The contribution is being provided through the Automotive Supplier Innovation Program (ASIP), a program that is no longer active, but throughout its lifetime supported automotive parts suppliers perform research and development activities. The program provided up to 50% coverage of project expenses to a maximum $10 million in Canadian manufacturing grants. ASIP grants are invested in projects that allow automotive suppliers to bring new competitive technologies to market. Funded projects plan to lead to the development of lighter, more fuel-efficient vehicles that create less pollution and emit fewer greenhouse gases (GHGs). In addition, a total of 80 job opportunities will be created across Ontario, British Columbia, and Québec. The Automotive Supplier Innovation Fund provided government grants to automotive manufacturers researching and developing innovative products, processes, and/or technologies. Funding contributions will be used to reduce the cost of prototyping, product engineering, pre-commercial testing and validation. Businesses funded through this program will increase their production capabilities, boost innovation, and become more competitive. In June 2017, the Government of Canada announced it would invest up to $11.5 million in ASIP grants to support 6 Canadian automotive manufacturing projects. Through these projects, the automotive sector will be able to offer more fuel-efficient vehicles that generate fewer greenhouse gas emissions. Additionally, each recipient will be better positioned to participate and compete in global supply chains. The Automotive Supplier Innovation Program (ASIP) was created to provide Canadian government funding to support automotive manufacturing research and development projects. The program has helped manufacturers adopt new technologies and improve their ability to drive growth and competitiveness within the automotive industry. Project activities aim to improve company productivity, operational processes, and innovative capabilities. Eligible applicant may receive up to 50% coverage of project costs to a maximum of $10,000,000 in automotive technology grants. Please Note: The ASIP Program is no longer accepting applications. However, automotive manufacturers can apply for funding through the Automotive Supplier Competitiveness Improvement Program (ASCIP) until November 7, 2017, as well as the recently launched Strategic Innovation Fund. As Canada’s automotive sector becomes increasingly more competitive each year, there are some industry trends that automotive manufacturers should be aware of. 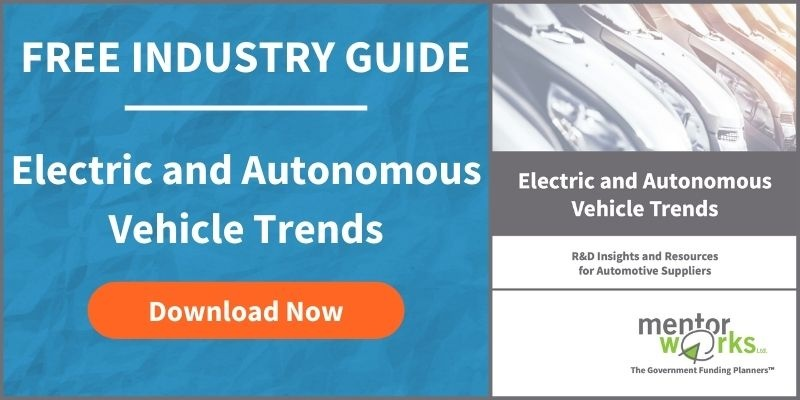 Learn more about the emergence of new industry trends, by downloading Mentor Works’ Top 4 Trends in The Canadian Automotive Sector white paper.